The Dog sends her apologies – she’s too busy to continue to write the blog. I suspect that she has found, as I did, that winter is a tough time for bloggers. I had a quick look at what we were talking about this time last year. There seemed to be a sprinkling of snow in the pictures, which we’ve avoided so far this year. 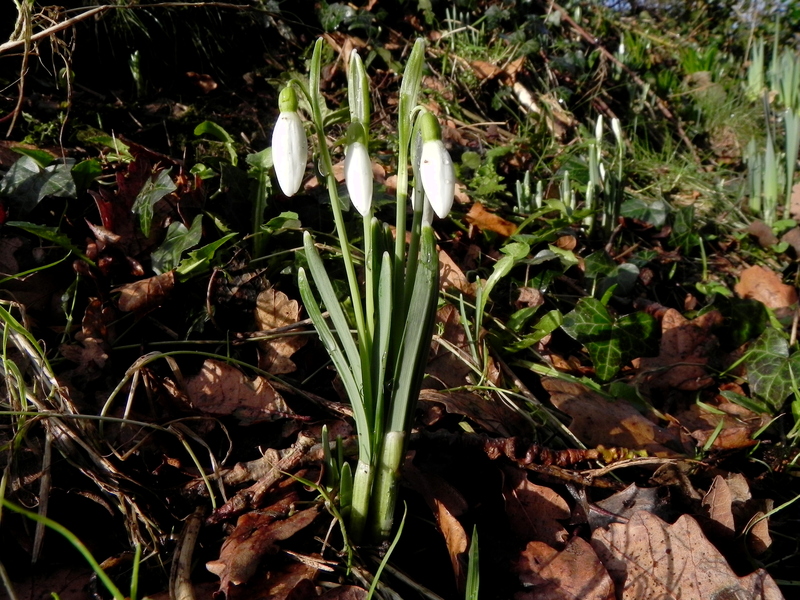 Like last year we have a sprinkling of snowdrops along the drive and in surprising places – under hedges and pushing up through the brown and grey leaf mould where you least expect it. 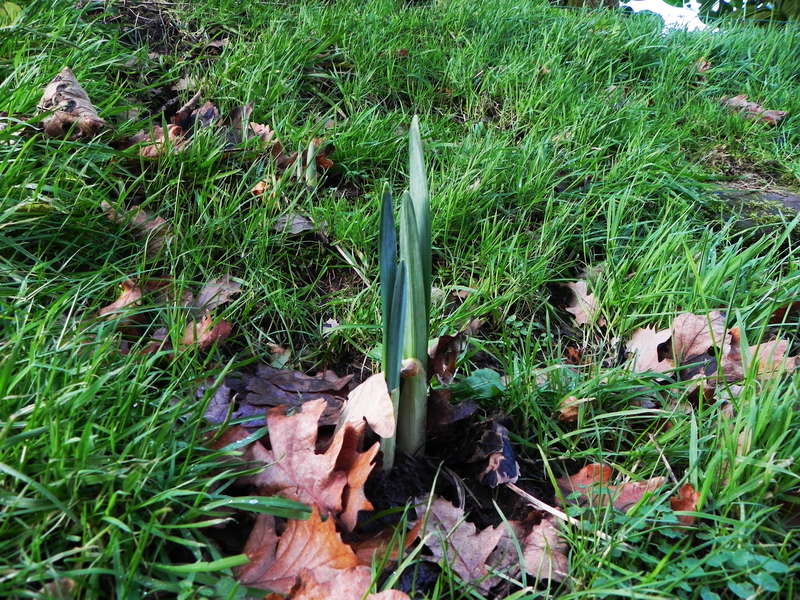 Last January I mentioned Ulysses or Odysseus, who was advised by Hermes to hold a snowdrop, as protection against Circe’s enchantments, while negotiating with her for the return of his crew. She had turned them into pigs and he needed men to row his boat, pigs are nice enough in their own way, but they’re not very good sailors. Hermes also advised him that if he was grumpy and waved his sword around (still holding the snowdrop), Circe would suggest that they should calm down and have a nice little cuddle and talk things over like adults. If he did this, keeping a firm grip on the flower, he would easily be able to turn his pigs back into men, he would defeat all her enchantments and she would be under his control. There are plenty of books of dating advice, available for download from that literature purveyor in the rain forest – but perhaps Ulysses, or Hermes come to that, weren’t big readers. Well, another week when we have concentrated on lying on the sofa coughing. We did go out a few times but his heart just isn’t in it. I really don’t understand what he sees in all this coughing and groaning. He went to the Dogtor, he’s finished taking the pills, surely he must be better by now? What he needs is a good long walk in the our fresh, bracing, recently washed in the rain and hung out to dry in the wind, air. I’ve tried, believe me I’ve tried – but he just won’t listen. Oh well, I’ve done my best. 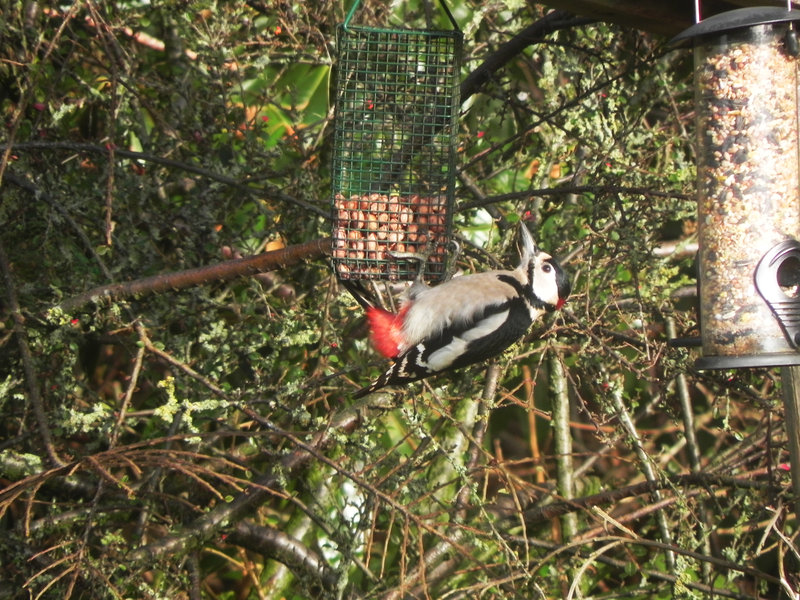 As a side effect of all this sloth, the best picture we have this week is this interloper in the garden. If I’d known he was there, I’d have laid him by the heels! I’ve been told to tell you, that although he is now found all over the world, originally he came from Turkey. Turkey normally comes with roast potatoes and Yorkshire puddings and gravy, round here. To which, I might add, I am particularly partial. But. Beware! There is erroneous information being circulated, I suspect by turkeys and their evil allies, that such delicacies are ‘Not Good For Dogs‘. I have yet to meet a dog (and I’ve met quite a few) who subscribes to this belief. On the contrary, I can assure you that a plateful of leftovers from any such meal is a welcome and healthy addition to every dog’s diet. Just go easy on the sprouts, will you. This has been a pretty sedentary week. He has just been lying on the sofa (in my place, I might add) barking his head off. If I barked like that there would be uncomplimentary comments all round I can tell you (postman excepted, of course). We’ve been trying to get him to go to the Dogtor but to no avail – until yesterday. It doesn’t seem to have helped much, except that he is now much more smug about his coughing. He spends his lucid moments complaining about how frustrating it is to be stuck there on his back while the rest of the world is getting on with it – and checking that the trains that run along the embankment keep to the timetable. The strange weather seems to have settled down, although I probably ought to say that very quietly, we don’t want to start it off again, now. The ferocious winds of last weekend and the early part of the week, and the driving rain and hail they brought with them, seem to have dwindled. At least the wind has dwindled to a more normal icy blast and the rain and hail now fall vertically instead of horizontally. With a little patch of blue sky and a smidgen of sunlight it seems quite spring-like. Until you go outside, that is. As we wander down to the beck, there is one place that I just have to visit. Inevitably this causes dissent, particularly if the weather is bad, which is most days, these days. The problem is, just a little farther along the road there is a small eddy in the weather, a minor whirlpool of clemency in amongst the clash of air masses and the stinging grind of the frozen or semi-frozen delivery of eco-friendly refills for the lakes here in The Lake District. The railway embankment is close by on the left and the field that usually has cows in – but has sheep at the moment, rises steeply ahead of us. At the bridge, the road turns right and makes its way under the tree tunnel and on this side of the bridge there is a group consisting of an ash tree and several hawthorn bushes growing by the waterside. For some reason there is always a quiet spot here, just before the corner. He is in a hurry to reach this sanctuary, while I have important and necessary matters pertaining to my social life to attend to. This results in an unseemly tug of war and makes it hard for me to concentrate. While I’m in a complaining mood, there is another matter I must raise. I do my best to keep the garden clear of these wretched free-loaders – both bird and animal. 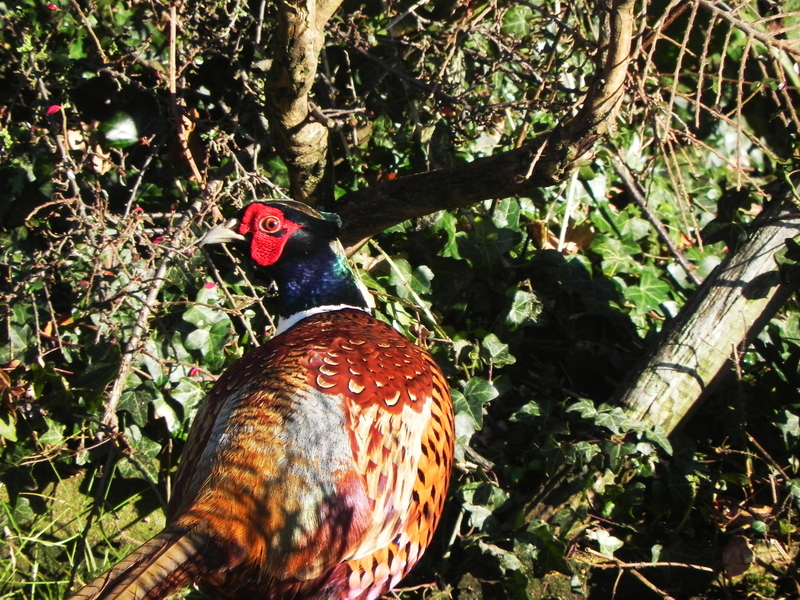 That pheasant, for instance and those pigeons. Next door’s cat knows better than to trespass on my patch and that squirrel has had the sharp edge of my tongue on many occasions. Why. Oh, why then, do they continue to put food out? Can they not see what a problem it causes? Here’s one of the culprits. Caught in the act.